Motorcycle theft remains a growing problem both in the UK and abroad. Every year more motorcycles are stolen, more motorcyclists are left disappointed and inconvenienced and even more is spent on anti-theft insurance policies. According to the Vehicle Crime Intelligence Service and the Police National Computer archives, it takes, on average, 12 seconds to steal an unprotected motorcycle. One motorcycle is stolen every 14 minutes in the UK, and less than 14% of stolen motorcycles are recovered. That?s pretty shocking, don?t you think? More than half of all motorcyclists neglect to use any form of motorcycle security on their vehicle, making it an obvious target for the opportunist thief. Here at GhostBikes, we want to avoid you falling into that category. The Oxford Security range features Sold Secure approved products. Sold Secure is an independent, non-profit making organisation dedicated to reducing the risk of theft by testing security products. The same methods of attack used by criminals on the street are replicated by Sold Secure in the assessment of security products. Many insurance companies offer substantial reductions to those who use Sold Secure approved products. A range of Oxford Security products have also been tested to Thatcham Vehicle Security standard. The Thatcham Institute for Vehicle Security is recognised by insurers as the UK?s leading tester of vehicle security products. Products with the Thatcham label have been demonstrated to comply with The British Insurance Industry?s Criteria for Vehicle Security ? the toughest set of standards ever to be applied to motorcycle locks and alarm immobilisers. As a result, many insurance companies offer significant discounts to those who use Thatcham Approved Products. Selected Oxford Products also have a key replacement service available. Grab your Oxford HD Chain & Lock 2.0m while stocks last! 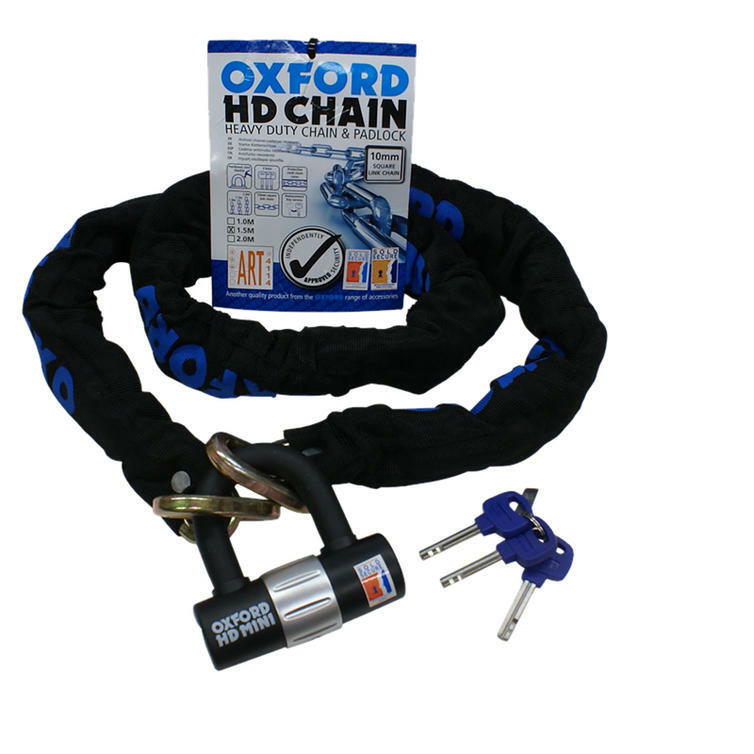 The Oxford HD heavy duty chain and disc lock is packed with features..